A pedestrian looks at front page headlines outside the Newseum in Washington, DC. New analysis from the Pew Research Center says 68% of Americans feel “worn out” by the amount of news, the same rate of voters who said they were exhausted by 2016 election coverage. The study also found more Republicans are tired of the news than Democrats. 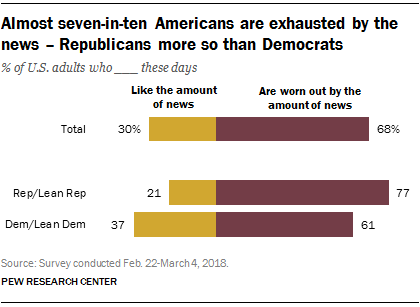 New analysis from the Pew Research Center says 68% of Americans feel “worn out” by the current news cycle, the same rate of voters that said they were exhausted by 2016 election coverage. The survey, which was conducted from Feb. 22 to March 4, 2018, found seven out of 10 Americans said they were overwhelmed by the amount of news there is, only a percentage off from the six-in-ten Americans who said the 2016 election coverage left them exhausted. Across the different groups analyzed in the study, those most likely to feel “worn out” by the news are white, right-leaning Americans who don’t think news organizations do a good job informing the public. The Pew Center reported in 2016 younger adults, women, whites and independents were more likely to be exhausted by news coverage. Republican or right-leaning respondents: 77%. Democrat and left-leaning respondents: 61%. The consistent fatigue described by the survey comes at a challenging time for news organizations, which have fared poorly among the public in an era of deep political division. The Pew Center’s analysis report suggests Americans’ exhaustion with news can offer some insight into the public’s view of the political process in general. The partisan divide coincides with rates of enthusiasm for the upcoming midterm elections in November, where more Democrats are said to be “looking forward” to the election, according to a January report from the Pew Research Center.